Brussels has called an emergency summit after British lawmakers rejected Prime Minister Theresa May's Brexit plan for a third time – giving London just 11 days to come up with a viable alternative. EU leaders will meet on 10 April, two days before Britain stands to crash out of Europe without a deal. May's plan was defeated by 58 votes in a ballot that took place on the day the UK was supposed to leave the European Union, before being granted an extension. The path towards Brexit remains unclear following the deal's failure – with France warning that its rejection “very strongly” increases the chances of a no-deal exit on 12 April. A statement by the Elysée Palace said: "The United Kingdom needs to urgently present an alternative plan in the next few days. Failing this, and it is becoming the most likely (outcome), we will see the United Kingdom leaving the European Union without a deal." The European Commission and the EU's chief Brexit negotiator Michel Barnier echoed warnings the UK was on track for a hard Brexit. A spokesman for the commission said it was no up to London to “indicate the way forward” before 12 April, for consideration by the European council, adding that the EU was fully prepared for a no-deal Brexit, and would remain united. 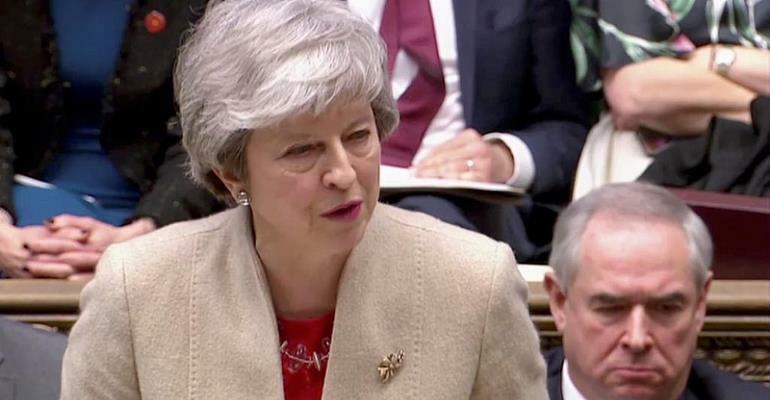 Following her deal's rejection, May told parliament it was “reaching the limits of this process” adding the implications of their decision would be “grave”. Meanwhile thousands of people angry at how the government has handled the Brexit process turned out for a "March to Leave" protest in front of Westminister.